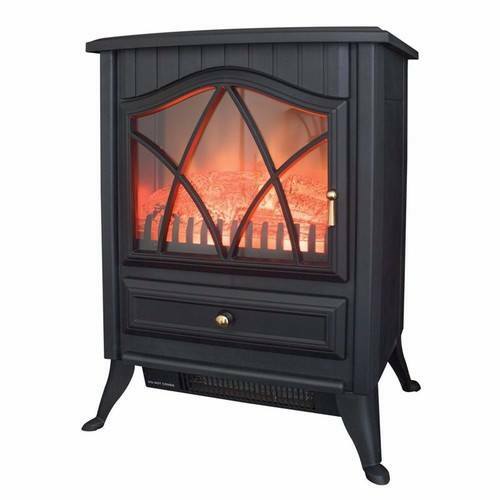 This traditional Cast Iron Black Electric Stove from Benross is an ideal decorative heater to use all year round. This free standing stove features classic small stove styling, without the maintenance and mess of wood, coal, or other fuel burning heaters. This stove is a fantastic alternative for solid fuel fires, and with realistic flame effects, this is as close as you can get to the real thing! The flame effects brightness can be adjusted and activated without heat, or with two heat settings, 900w & 1800w output. Note: To replace the bulb on this model, disconnect from power and locate the three screws on the units front. Loosen these, then remove bracket behind grill which holds log bed. Pull log bed from both ends to reveal bulbs beneath. Bulbs can be replaced with a 25W G9 halogen bulb. Reassemble by following the instructions in reverse.